Commander Zilyana is a powerful boss in the God Wars Dungeon. Her primary attack is melee although she also uses a magic attack. Zilyana’s attacks magic attacks will hit every player in the room at the same time, but she will only use this magic attack when she is within melee distance of a player. 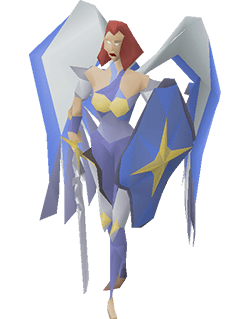 For this reason, combined with the fact her melee speed is very high and that she can hit up to 31, the primary tactic at Zilyana is to use stamina potions to allow yourself to ‘kite’ Zilyana around the room and attack her with range while she’s kept at a distance. Ecumenical keys – Due to the difficulty in getting the 40 kill count required to enter the Saradomin boss room – it’s highly recommended to obtain an ecumenical key instead. The ecumenical key will allow you to bypass the kill count requirement and can be obtained much quicker from the Wilderness God Wars Dungeon before you make your trip to Saradomin. God Wards Dungeon Notes – You will need to bring one rope to gain access to the dungeon for the first time and access to Saradomin’s Encampment in the dungeon requires you to have 70 agility and two ropes (first time only). When entering the dungeon, you will take damage from a variety of different monsters if you are not properly prepared. There are certain god-aligned items you can equip in order to give yourself protection from that specific god’s followers. For example, equipping a Bandos Godsword while in the dungeon will make all minions in the dungeon which are aligned with Bandos non-aggressive. The protection needed in order to have full protection in both Saradomin’s corner and Saradomin’s Encampment in the dungeon is Zamorak and Saradomin. While the tactics for Commander Zilyana are a little more involved than the other God Wars Dungeon bosses, once you get some practice it will start to come naturally. when you enter the room, use the protect from magic prayer and immediately run to the wall. As Zilyana starts to approach you, attack with your ranged weapon and immediately retreat along the wall, while simultaneously attacking. Once you reach the corner, allow Zilyana to get a little closer and then attack again, whilst running along the next wall. In this manner, you can take 0 damage from Zilyana, and you will only take damage from the ranged minion. Using melee at Commander Zilyana is really not recommended unless you’re in a group, but making use of Verac’s ability to hit through high defence does make it viable. Ideally, you have a group of three players all using Veracs to make this method most effective. You should use protect from magic prayer and focus on trying to down Zilyana as quickly as possible, before switching to the minions. If you’re in a group of players, you may want to bring a rune pouch for high alchemy. The Zamorak Godsword can be swapped out for any other decent spec weapon and if you want to prepare for long trips, a full set of Guthans will help you heal up between kills.